The Roman deity Mithras is one of those ancient deities about whose myth and cult we know little. No description of his mysteries has come down to us, nor any certain idea of the cult myth. Most of what we know for certain we learn from monuments and archaeology. The purpose of these pages is to assist the general reader. The intention is primarily to make sources available, or accessible. The intention is to avoid promoting any particular opinion about Mithras or about Mithraic studies. Rather the intention is to provide as much primary data as possible, and enough information about the secondary data, to permit a reasonable person to form his own conclusions. These pages make no claim to scholarship, or to anything other than a greater access to the sources than most people. Wherever possible the references will be linked to some online Google Books preview, so that the reader may verify for himself what the source says, and whether the statement made is a fair discussion of it. A few other points should be mentioned. Sources for Mithras, and what this site will do about them. Much modern literature is not very helpful. Far too much of it contains speculative statements presented as fact. Usually these kinds of works fail to give much - or any - ancient evidence for the statements made, even if very controversial. Often these go back to some speculative statement by the great Franz Cumont. The authority of Cumont was such, before 1971, that even non-specialist academic literature repeats some of these myths. But Cumont's theory is now exploded, and held by nobody. Nor will it ever return. This means that we need up to date sources, of good quality. The only reliable sources for Mithraic studies are the ancient evidence itself, and modern studies made by specialist Mithras scholars.1 Anything else is very likely to contain statements for which there is, in fact, no evidence. Ancient information about Mithras (or any other topic) is of three kinds. This site will attempt to make all this material more accessible to the general reader. A collection of all the ancient literary texts in English is provided for the use of the reader. Likewise this site will attempt to create a gallery of widely available images of monuments, together with scholarly data about them. The objective here is not to record every piece of data known about a monument or inscription, nor to provide an exhaustive bibliography. Rather the CIMRM number will be given, at least some of what the CIMRM says about the item, and a photograph of it, if at all possible. Some effort will be made to include items discovered in the last 50 years as well. Inevitably there will need to be some discussion of the unreliable sources as well, and an FAQ of some kind. There is an ocean of material which is neither by specialist authors (even if it is by academics) nor based on the primary data. A list of this would be of infinite length, and all of it, in the end, would be useless. Relation to the Wikipedia article. The majority of material in this site is new, but some of it was originally contributed to the Wikipedia article on the mysteries of Mithras. For details on the latter, see the FAQ. Corrections to and comments on the material on this site are very welcome. Please use this form to contact me. A note about images on this site. A snapshot of the search results from Google Images. 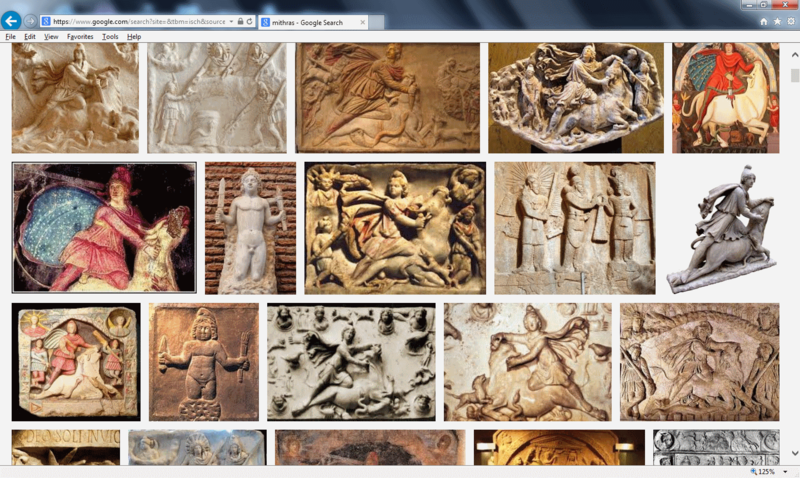 If you go to Google Images and search for "Mithras", you will quickly find a considerable number of pictures of Mithraic monuments, of varying quality. The majority appear to be amateur photographs. If you look hard, you will find more. Nearly all of these images are in full colour. In many cases the images are excellent, and far better than anything that has appeared in print. But in almost every case, there is no way for the viewer to link the image to the literature. A reader may see a striking picture; but he has no way to find out anything about it. One of the aims of this site was to address that problem. The structure of the monuments page is designed to allow the reader to skim images until he finds a picture of the monument that he is interested in. The use of pictures widely available is, therefore, deliberate and necessary. The more widely available the picture, the more important it is to have a thumbnail of it here, with a reference and a bibliography. The reader can then return to the source site, infinitely better informed. In some cases, where the source site permitted, I have added a comment with the CIMRM reference and a link. The object of all this is not traffic; rather it is to inform and enlighten. The result is that there is now a great number of images on this site, taken from wherever they could be found on the internet, or from books and articles. Originally I just linked to images; but I quickly found that the sites from which they come often disappear as quickly as they appeared. I have reluctantly been forced to host copies here. 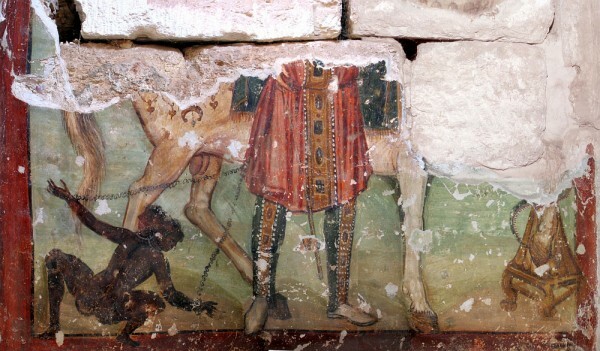 painting from the Hawarte Mithraeum in Syria. Photos on this site taken by me may be used freely for any non-commercial purpose, but not contributed to Wikipedia. There is no need to write and ask! For photos which are not by myself, the reader should use the provided link to the original source to seek any copyright owner and ask permission for use. Some of the latter are plainly released under Creative Commons, while in other cases it is not clear what copyright there is. In many cases the sites do not make it practical for me to contact the authors and ask permission. Nor is it practicable for me to write three or four emails of enquiry for every page on this site. I hope that it will be remembered that this is not a commercial site, run by a corporation, but a labour of love undertaken to assist everyone on the web with any interest in the subject; to create a catalogue of images to which the reader can refer, whether onsite or offsite. In some cases I have uploaded or linked to the only image that I can currently find, in the hopes that at some point I can replace it with a better image. I am very happy to credit or link to the owner of any image. But if you own the image in question, and you would like it removed even so, please write to me and I will be glad to oblige. A final thought or two. The basic problem of Mithraic studies is that the data transmitted to us is insufficient to answer the kinds of questions that we should like to ask. While this cannot be solved by a website, I would hope that at least better access to the data will help the honest enquirer. I have added the facility to make comments to the pages. Constructive comments and enquiries are more than welcome, but all comments will be moderated. 1 The standard university textbook is the excellent English translation made by Richard Gordon of Manfred Clauss' book, The Roman cult of Mithras: the god and his mysteries, Translated by Richard Gordon. New York: Routledge, 2000. Pp. 198. ISBN 0-415-92977-6. A Google Books preview is here. This is available remarkably cheaply in paperback at Amazon.com.